The Korean Music Group aims to rekindle the spirit of ancient festival sharing the inner-energy through the art form that can enrich our life. Festival is the place where everyone’s energy mingles together creating a sense of pleasure in a collective manner. The fundamental basis of their creative work is a Korean percussion play. Since the beginning of the formation, they have tried many different kinds of performances based on the traditional rhythm of Korea. As a result, they have developed unique performances and interactive programs including Binari and Taonori performances and interactive Korean music workshops which introduce Korean music and arts to the participants. The Korean Music Group believes that creating a sense of community is important in many cultures. Their performances and interactive programs attempt to build harmony and unity of community among the audience members and performers. 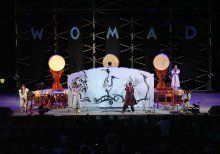 Their energetic and passionate Korean Drummers have staged hundreds of international performances and recently toured Hong Kong, Singapore, Australia, Israel, Africa and across Europe. The Korean Percussion Group also conduct workshops, classes and camps on Korean traditional arts and are open to all age groups. The term literally means “appealing the anxious heart to a supernatural being.” In the Korean traditional music scene, Binariis often regarded as a song played with other various repertories. 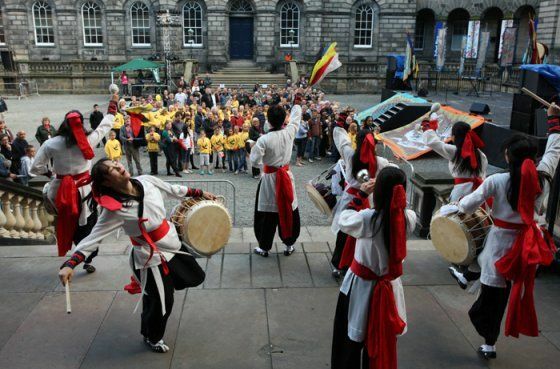 The Korean Music Group adds its own colour to this ancient theme by reviving an ancient ritual that used to be held at the beginning of a festival celebrating the forces of nature. The performance starts with an on-stage procession with audience members participating in front of the stage curtains. The actual performance by The Korean Music Group begins with smoothly synchronised beating of huge drums. The performers’ mirror the atmosphere of a thunderstorm, as they make their drums grumble and roar. The performance concludes with a gripping percussion performance of Korean traditional music ,which encourages the audience to follow their tireless beat to the imagined banquet of the festival’s conclusion. Taonori is an interactive performance with dynamic percussions and intends to create intimacy between the audience and the performers. 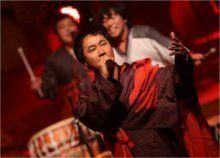 Taonori intends to show the audience the way to free themselves from smothered everyday life and express vitality from deep within their heart –like that of players in the ancient festival. To the performers, the very essence of the festival is a joy itself. ‘The state of mythic chaos’ that creates a whole new energy is Taonori that The Korean Music Group dreams of. 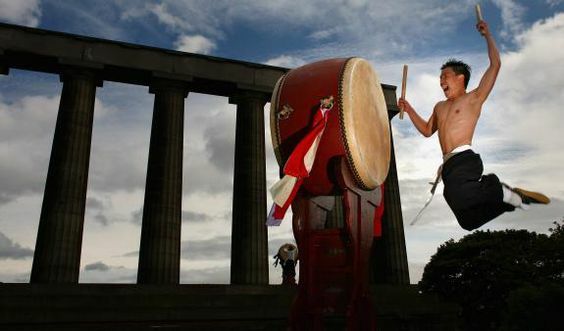 Throughout the performance, the performers constantly entice the audience to join their festival with the powerful sound of drums and dynamic rhythms. 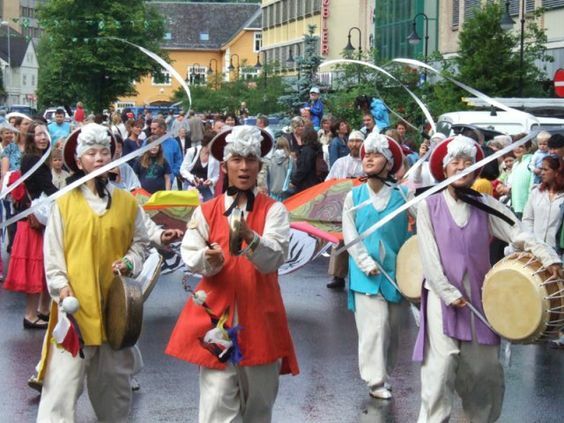 Join The Korean Music Group for an interactive Korean music workshop that will be a practical journey into the indigenous arts of Korea, including percussions, song & dance and traditional games. Learn the rhythms and culture of Korea with full passion and energy, all the while experiencing a new sense of community! The enthusiastic members of The Korean Music Group will guide you to experience new rhythms in your body through music and dance, and help you explore and develop your own creativity. You will find yourself smiling to your new friends with exhilaration and joy. The Korean music workshops are suitable for any age group over 5 year old. The available activities include percussion, drum playing, learning Korean folk songs and dance, flag installation, flag fighting, totem pole carving etc. Their pace never lets up. It’s a gripping performance of delicious percussion, crashing drums and rabble-rousing vocals, with an Iggy Pop moment when the leader strips to the waist and urges us to sing ‘oi, oi, oi’and similar chants along with the beats. Traditionalism and spectacle merged in The Korean Music Group whose name means. The group played huge drums placed overhead, along with flutes and a koto like zither. They set up deep, pounding rhythms derived from outdoor farmers’ festivals that could probably be heard in the next village. But they had modern show-business touches, too. Its singers cued audience participation like pop stars, gesturing with wireless microphones. At one point the melody on a double-reed instrument turned into the “Olé, Olé” sports cheer! A giant wave of energy and enthusiasm from the talented performers. The largely female ensemble demonstrates an incredible physical strength, banging their drums with formidable force. And the closing conga, which snakes round the vast Quad, attracts all but the most reticent audience members. The evening’s biggest eureka moment, however, came courtesy of the Korean ensemble, which was making its stateside bow. From an opening number that found its members playing all surfaces of three wildly oversized bass drums that dwarfed them, the septet veered between keening traditional folk and neo-psychedelic, harp-based jams. Theirs was a revelatory performance, proof that it’s still possible to find something new under the sun. The performers’ uncontainable energy sparked over into the audience when they led them to join in, teaching them a rhythmic traditional song and encouraging them to clap with the beat. They then herded everyone outside for a conga-like finale in the balmy June evening –perhaps a mistake on their part, because everyone was having such a great time, the audience were reluctant to let the performers finish and leave, and the drummers were surrounded and outnumbered.